WoL Draft. I disagree, sir. On the most recent episode of The Reserve Pool (ep 66,) the cast all seemed to jump out of their seats to say Fatality - Bounty Hunter is the number one draft pick. I respectfully disagree. I feel that the cost of set up is too great. I love direct damage in draft too, however in draft you are often only rolling 4 or 5 dice at a time and cannot depend on a fist full of sidekicks to get you the energy like PXG. The set needed as I see it is there needs to be a Fatality in bag. 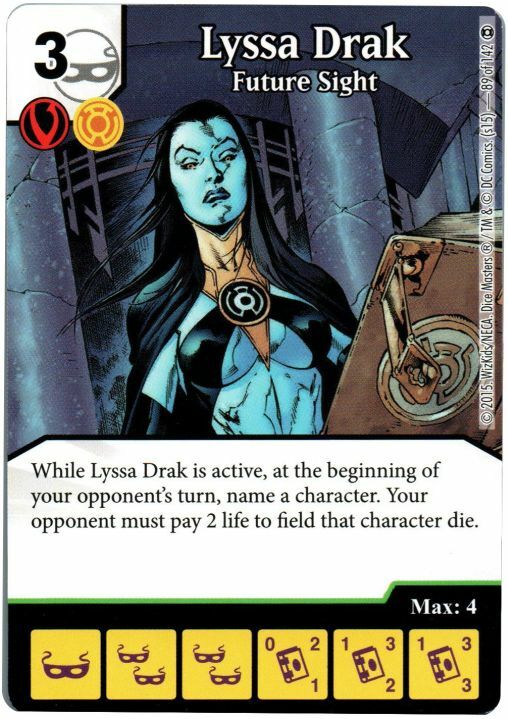 The turn before you hope to draw her, use something like Resurrection global or Villainous Pact global to grab and extra die. Now with 5 die, one being Fatality, lets say one is Bleez - Victim. The after roll and reroll lets say the results are Bleez is 2 bolts, Fatality is lvl 2, fist, mask, wild. I hope you drafted a common Parallax so you can try again. Maybe you get the 3 bolt and it all works out. If you had only pulled 4 die and gotten all bolts, it's hard to say that you can still have them after paying to field her. I suppose this senario works if you've fielded most of your sidekicks and can get your other bolt characters on time. This is where my main issue comes into play. Low cost bolts are scarce in this set. There are no 2 energy bolts. We are looking at a string of 3 & 4 cost. 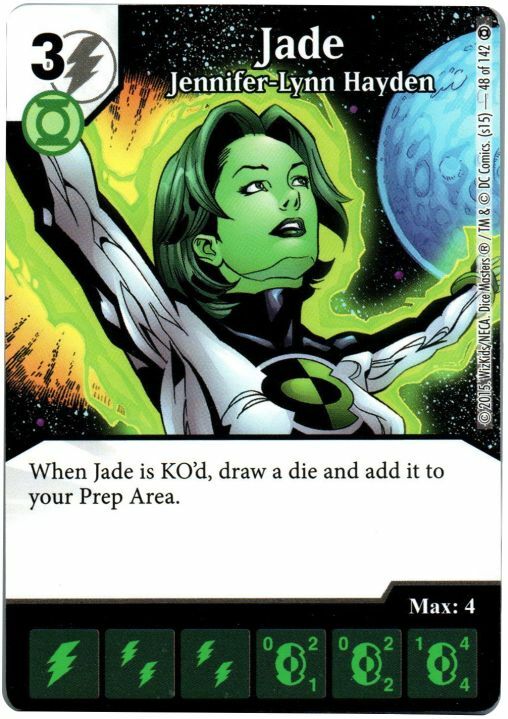 If you are lucky enough to draft my first pick for draft, Jade - Daughter of the Golden Age, then this plan looks better. I think that it's an awful lot of set up. I'm not here simply to shoot down the pick. It's a fine pick. I'd like to offer an alternative. Draft Fatality if you must, but if she's all taken by the other drafters, I highly suggest going into shields. The common Wonder Woman isn't getting any buzz, but she deserves it. Shield support is strong. Common Monk is a great pick up 2 shield character. He becomes a bigger threat with any Indigo-1 present. Wonder girls common is another 2 shield character that will let you count more readily on getting those 3 shields, but I think her uncommon 3 shield version is better as she helps keep all the sidekicks your fielding safe from magic missile . One thing I like about Wonder woman here is that this is a when active ability so your shields are free to be spent on globals, which is important because you win with a a slew of unblockable sidekicks that use transfer power to pump their damage! The only issue I see is the interpretation of when the shields are required to be in the reserve pool. A the card reads, it seems that if you roll the shields the condition is met and they don't have to stay in the reserve pool at all, leaving you free to use the resurrection global or and buy a character or use the Transfer Power global once. Man you took my thoughts on a blog entry, i was thinking the same. And i just hope those "Rolls" are treated like Magneto Hellfire Club for Drawing as an Instance in Itself. Otherwise i cant count on Wonder Woman. I think my first pick would be Dextar, Beast Boy and Wonder Girl with Anger Issues and Transfer Power yes. I said the same thing. The only 2 cost bolt out of WOL is Miri Riam. The point of rolling and wishing for bolts is ....for the lack of a better term just (f-bomb) dumb. The same thought for Wonder Woman. The two characters out of draft I would gladly pick in my two packs are the one's below. The set is very slow so I rather have something to grant me some ramp AND deduct the prices on my lantern characters. 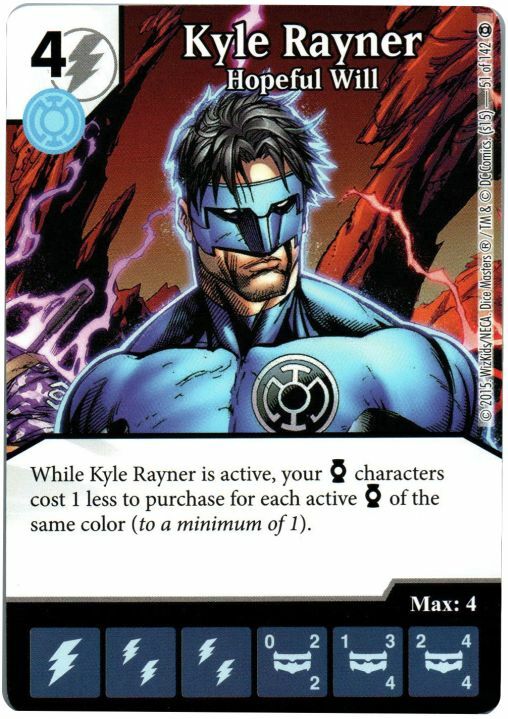 Kyle Rayner being universal deduction for just my side. Literally sit her on the damn field and call out stuff before your turn ends. It helps if your team is just smashing them in the face knocking them out.